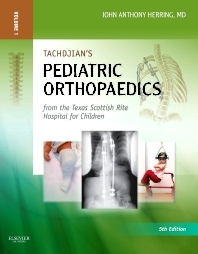 Continuing the tradition of excellence that began in 1972, this latest edition of Tachdjians Pediatric Orthopaedics offers the detailed visual guidance; and unmatched expertise you need to effectively diagnose and treat pediatric musculoskeletal disorders. Extensive updates offer you the latest knowledge on etiology, imaging, differential diagnosis, and non-operative and surgical techniques for a wide range of pediatric orthopaedic conditions. Access expert guidance on difficult diagnostic and clinical management issues for your most challenging cases. Perfect your technique with the visual guidance of nearly 2,500 full-color illustrations and 60 videos of pediatric surgical procedures, including a number that highlight clinical examination and unusual clinical findings.